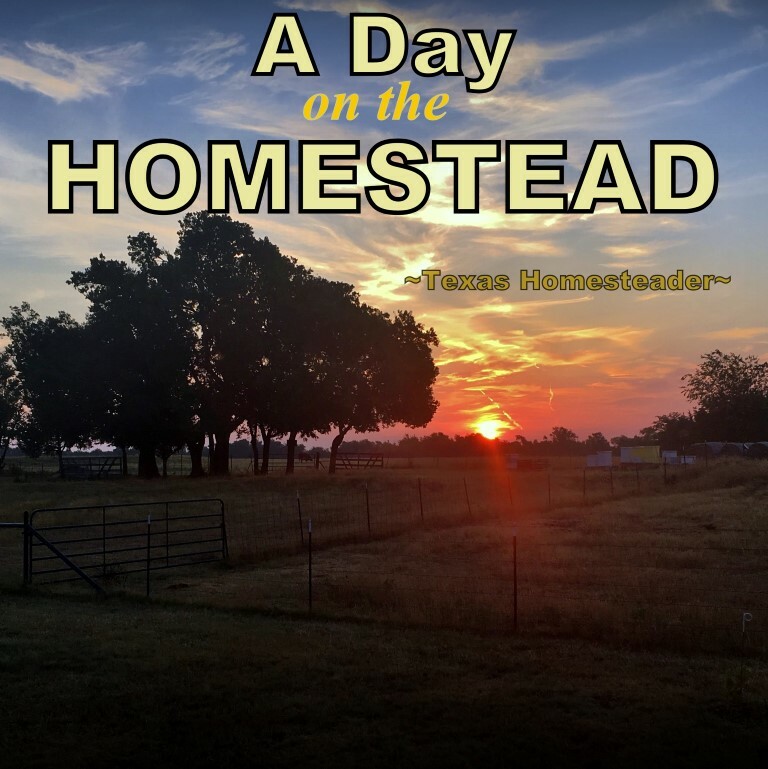 Did You Ever Wonder What A Day On The Homestead Was Like? RancherMan & had I reviewed our upcoming tasks. We’ll be weaning a group of calves soon, but immunizations aren’t very effective if the calves are stressed. So we like to give their first round of immunizations before weaning and then send them back with their dams. Then in about 3 weeks we’ll administer the boosters to get them all off to a healthy start. But we also have a few cows that we need to pregnancy check to confirm pregnancy. We’ll need to send them through the chute and collect a small blood sample to send to the lab. This is typically pretty low stress for them and a quick task for us. We’ll do this at the same time we’re immunizing the calves. All in all it shouldn’t take long. So, bright & early we go out into the pasture to bring the herd into the barn paddock. Then we’ll sort the bovines we need to work and send the others back into the pasture. A little history here: There are 2 cows that for the past 2 years have just not fit in. They’re gorgeous registered Angus cows and we bought them as calves directly from a breeder. We’d blended them with our own herd and always treat them as gently as we do the others. 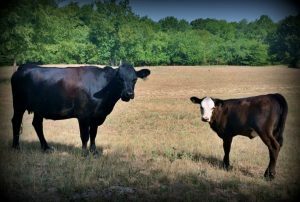 Although to us they seemed a bit high strung as calves, our hope was that our calm cattle would comfort them & help them settle to the rhythm of the herd. And they did settle down, quite a bit actually. Both of those Angus calves grew up and had even calved here. But still they were more high strung than our docile herd. For these Angus girls we always went the extra mile to treat them with calm & patience. Like our other cattle, we wanted to teach them that there’s nothing to fear when we’re around. We’re the good guys! But they’ve always been a continuing problem, especially when trying to work them. So today we try to gently guide them to the pens with the other cattle – not startling them but moving and speaking gently. We realize that they’re still a little higher-strung than our Herefords and we need to go slow. But instead of walking along like the others, they run like demon-possessed crazy cows. So we started over and tried again. And again. AND AGAIN. We decided then & there that these Angus cattle just would never fit into our herd the way they needed to. They were beautiful girls and certainly high-quality cattle alright, just not the temperament we require here on our Homestead. So – we try to get them penned so we can load them up, but one of the calves crashes through the fence & runs to the back pasture with the herd. We continued to work to get the other Angus cows penned and finally we were successful. Now what to do about that calf?? We went to the back pasture & tried to gently coax him back to his mama. But he wasn’t having it. So after quite a while of trying, RancherMan went to the shed & fetched a lasso rope. He lassoed the calf & took him to the waiting cattle trailer. WHEW – we spent so much time trying to corral these cows that now we barely have enough time to make the sale. So we pull to the driveway & RancherMan performs our typical safety check on the trailer. He checks all the connections & the tires, added some air to a couple of tires and we were ready to go. Now the air conditioning is broken in our truck with no wiggle room in the budget to get it repaired right now. So even though the heat is stifling, the windows are all rolled down. My hair is pulled back into a ponytail but plenty of hair is still whipping around in my face & into my eyes, as sweat continues to roll off my body. This 3-hour round trip is going to be tough alright. Then it happened – about 5-10 miles down the road, one of the tires throws the tread. Groooan… Of course we have a spare tire on the trailer so that’s not the trouble. The problem is our location on the side of a 2-lane blacktop – and the fact that our trailer is loaded with about three thousand pounds of bovine. 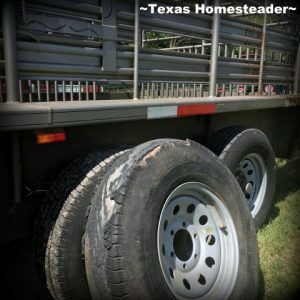 Since we’re on the side of the road and the trailer is loaded down, we can’t just use our regular tire jack to change the tire. We needed a heavy duty hydraulic mechanic’s jack. So we turned around and headed back home. We used our emergency blinkers and drove verrrry slowly on the shoulder to keep that tire from giving up the ghost completely on the way home. Once we got back home RancherMan noticed the electric trailer brake wires were also damaged. Apparently when the tire tread blew it damaged the wiring for the brakes, so that had to be repaired also. WHEW, it’s taking much longer to get to the sale than we thought! Finally the trailer was once again road worthy and we were ready to head out again. We called the sale to see if we even still have enough time to make the sale today. Neither of us are anxious to unload these high-spirited cattle and attempt on another day to once again get them corralled & loaded. But thankfully the folks at the sale say we still have plenty of time, so we continue on. But what’s this? Ugh, our fuel gauge shows our fuel is too low for us to make it the distance to the sale. That truck is needed for power when hauling cattle, but it’s not good at all for gas mileage. So, yet another unscheduled stop for gas. It’s always awkward to try to navigate a double-cab pickup truck pulling a 16-ft trailer loaded with cattle to a gas pump. But RancherMan’s a pro at it! We finally get the tank filled with gasoline & hit the road again. Although it was miserably hot, we had no further incidents. And thankfully we made it to the sale on time. WHEW! I’m disappointed that we couldn’t make it work with these Angus cattle. But we gave it two years to try to help them fit our operation. I know they’ll be a fine addition to another ranch for sure. But I’ll admit that it’s nice to know that working the cattle will be much less stress for us and for our other cattle from here on out. Now peace & harmony reign again on our Texas Homestead.